For most people, home improvements are a more gradual thing then the major renovations we see on TV. If you’re looking to add some value and livability into an outdated bathroom, we have a few really simple tips that can make all difference on your bathroom’s appeal and value. Vintage things are always going to be cool. People like the look of something that is intentionally traditional and expertly repurposed; it’s interesting and thought-provoking to take something old and find a new use for it. If you’re shuffling your feet looking at the price tags found on the small, prefabricated vanities at the department or hardware store, then consider repurposing an old dresser. All you have to do to go from tired vanity to incredible statement piece is follow a few simple steps. Start by decorating the dresser the way you want it to look (ensuring that it is the desired height, of course). From there, carefully separate your current vanity from the sink, and measure the area of the sink basin; cut a hole that will allow the basin to rest upon the top of the sink itself and adjust all inner drawers to accept the piping. With any luck, you should have 2-3 fully functioning drawers that require little augmentation to continue working – remember, you can easily add a wooden insert to form a “false back” in front of any pipes when closed. One incredible way to add value to and modernize an old tile shower is to dig out a soap dish in the far wall. Simply cut a square or rectangle (usually at least 1’ x 1’), then construct a simple plywood insert to hold tile and grout. 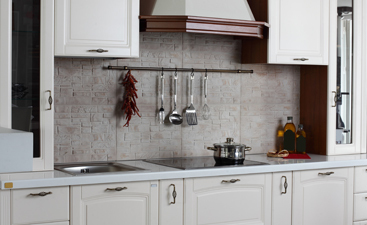 From there, purchase a complimentary tile that can make a nice statement to a plain or boring tile wall. 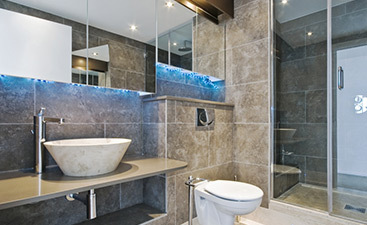 You can even get numerous tiles and make a design in the recessed area. This change is inexpensive, but adds a high-value look, as well as a great place to store bodywash and shampoo bottles. Consider doubling up on your tile purchase to line the perimeter of a plain mirror; you’ll have all you need from a soapdish installation, now you can find another use for the same materials by giving your mirror a beautiful (and complimentary) frame. Maybe your newfound experience with tile laying in a small area will motivate you to update the shower tile altogether down the road! Rocks are cheap. In fact, they are one of the least expensive building materials you can find anywhere, yet they can add tremendous value when used appropriately. If you take the same grout you need for your shower’s soap dish, you can quite easily create a textured floor that looks awesome. 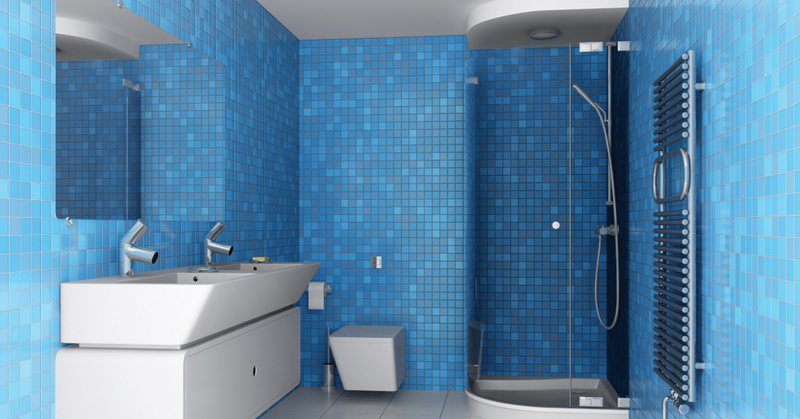 All you’ll need is a couple gallons of smooth, multi-colored stones and you’re ready to “tile” away. 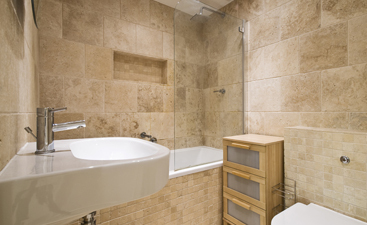 Keep the stones flat on the floor of the shower, but do not allow for too much spacing between stones. The effect created by the finished product is great to look at, provides a much less slippery surface, and actually massages your feet as you shower! This simple DIY home improvement can add value and comfort without coming close to breaking the bank. Stop into our showroom to view all of our bathroom tiles, including some of the most versatile flooring and wall tiling options you’ll find in the Thousand Oaks area. Be sure to set an appointment with our friendly staff whenever possible to guarantee that you get all the one-on-one attention you need from our dedicated tile experts to look through all of our options.